Alzette Investment, a company fully owned by entities advised by affiliates of The Blackstone Group International Partners LLP, has bought 16.56% of Hispania for 315,37 million euros from QP Capital Holdings Limited and QPB Holdings, owned by George Soros. The US fund informed the Stock Market Regulator (CNMV) that it has also agreed to launch a voluntary takeover bid for 100% of the Socimi. 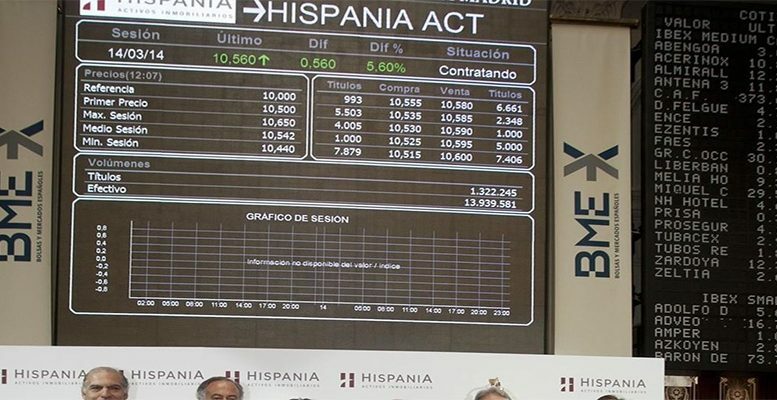 Blackstone has bought 18.07 million shares of Hispania, equivalent to 16.56% of capital, at a price of 17,45 euros per share, implying a discount of 5.67% on Hispania’s share price yesterday before trading was suspended (18,50 euros). With this price, the company headed by Rafael Miranda is valued at 1.905 billion euros. At the same time, Blackstone’s board of directors has agreed to formulate a voluntary bid for all of Hispania’s shares, excluding those it already owns. The cash offer will also be at price of 17,45 euros for each Hispania share. The US fund continues to show its interest in Spain’s hotel sector. It has already acquired 51% of Popular’s property business and HI Partners (Sabadell’s hotel subsidiary). And on December 7, it tried to buy resorts from the Alua Hotels chain in the Balearic and Canary Islands, which Hispania finally acquired. In opinion of Link Securities’ analysts the operation makes strategic sense for both parties. Hispania is being transformed into a platform exclusively for hotels, with the aim of transferring its management or being bought before March 2020. Blackstone could unify Hispania’s business with the recently acquired HI Partners to create a hotel giant in Spain. That said, different media sources flagged yesterday that Blackstone was not the only fund interested in buying Hispania. Experts at the house gives the stock a target price of 17,97 euros/share, which has been exceeded with the revaluation over the last few days (almost 12% in the last 6 sessions) in Hispania’s share price after these takeover bid rumours. (Before the suspension, Hispania was trading yesterday at 18,5 euros/share). The transaction would also be attractive for some of Hispania’s core shareholders like George Soros (16.7% stake). In principal, they were keen to end their investment in Spain soon, because the socimi’s liquidation was set for 2020. Head of Research at Link Securities, Juan José Fernández-Figares has been analysing financial markets and companies from a wide range of sectors for over two decades. He also advises clients on their investments. For the last ten years Fernandez-Figares has been developing models based on algorithms, oriented towards stock picking for portfolio and fund management.